Ray Fryberg, Patti Gobin and Chelsea Craig perform of one of Harriette Sheldon-Dover’s songs. If you look up the word resiliency in the dictionary there will be a picture of the Tulalip leader, Harriette Shelton-Dover. Or at least there should be, because she is the very definition of the word. Harriette was a boarding school survivor, cultural preserver and language revivalist. She was a highly respected leader as well as a daughter, mother, cousin, auntie and grandmother of the Tulalip people. Harriette restored the practice of the Salmon Ceremony, testified during the Boldt decision and was the first chairwoman of the Tulalip Tribes – to name a few of her accomplishments. But perhaps one of Harriette’s biggest accomplishments was rebuilding pride in a tribal community during and after years of forced assimilation. She knew her language, rights and culture and stressed the importance of both practicing those traditions as well as passing them down to the next generation. Harriette passed on to the next life in 1991, yet her teachings continue to inspire generation after generation. Despite her boarding school experience, Harriette knew the importance of an education and received her college degree from Everett Community College during the seventies, while in her seventies. While attending the college, Harriette met Darleen Fitzpatrick, a young Anthropology Professor who was teaching a course on Northwest Coast tribes. Darleen spent every Friday, for two years, recording Harriette as she shared the history of Tulalip as well as some of her personal experiences. In total, there were nearly two hundred cassette tapes, filled with audio recordings on both sides. 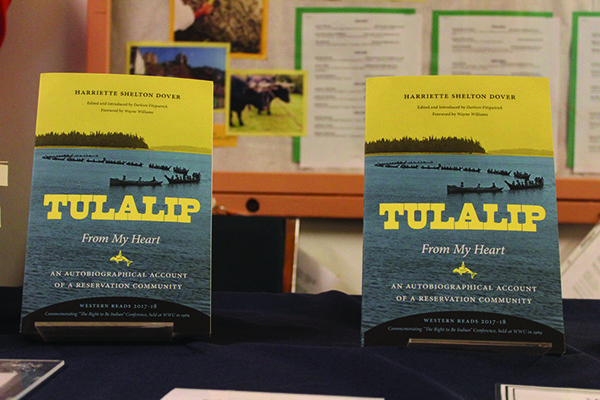 After years of transcribing, editing and placing Harriette’s accounts in chronological order, Harriette’s memoirs were published by the University of Washington Press in 2013, twenty-two years after her passing, in the book titled Tulalip, From My Heart: An Autobiographical Account of a Reservation Community. Western Reads is a reading group designed for the new students of Western Washington University. The book club promotes intellectual engagement through a variety of events and activities. Every year, Western Reads collectively decides which book they will be reading; for this year’s selection, the group chose Harriette’s From My Heart. “We feel that in the past Western has not done a good job of acknowledging the Indigenous culture. This is an opportunity for everyone to reflect on this history of this area and how this history is represented,” states Dawn Dietrich, Director of Western Reads. Western Reads hosted a forum on October 4, at the Fairhaven Auditorium. During the forum, the reading group witnessed guest speakers Darleen Fitzpatrick, Ray Fryberg and Patti Gobin recount the life and times of Harriette Shelton-Dover. Ray spoke of the boarding school atrocities and shared a little bit of Harriette’s experience at the school. “She talks about being raised by her grandmother,” says Ray. “The teachings that she got from her grandmother; being introduced out into the woods to the four directions, how to sit properly in the longhouse because people are going to look at you to see how you were taught, because your teachings reflect on your elders. Then she went to the boarding school. She said that during her experience at the boarding school, two boys from Lummi ran away and she knew that they went out and caught them so she and [the other students] had to go back to their dormitories. They all looked out the window, down at the school, to see what they were going to do to the two boys that ran away – they whipped them so hard that it took them forty-five minutes to crawl from the school to the dormitory which was only a quarter of a block. Patti Gobin is Harriette Shelton-Dover’s grandniece. Patti explained that the boarding school experience left many Native Americans across the nation lost, including her grandmother, Celum Young. “My grandma, she was so broken, split between two worlds: being ‘civilized’ and uncivilized,” explains Patti. “I say that in a good way because that describes my grandma. Uncivilized being something very bad and civilized meaning something you needed to attain. My grandma was first generation in the boarding school, her first language was Lushootseed, her first culture was Coast Salish; and in the blink of an eye she was no longer Coast Salish, she was no longer Indian. She was going to be Catholic, her name was now Cecilia and she was going to speak the English language. Patti explained the importance of introductions within the tribal community. She demonstrated how she first introduced herself to Harriette, looking down at the ground in a soft-spoken voice. The entire crowd was moved by Patti’s story, many book club members were in tears while listening to Ray and Patti reflect on the impact Harriette left for the future generations of Tulalip. The forum ended with a performance of one of Harriette’s songs by Ray and Patti accompanied by Patti’s daughter, Chelsea Craig. “I think the event was amazing,” says Dawn. 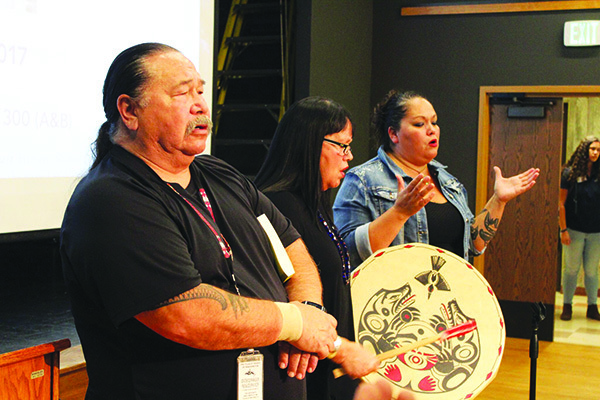 “It was so moving not only to read Harriette Shelton-Dover’s account of the Tulalip culture and the region that we all share here, but then to actually hear members of the Tulalip tribe come with very personal connections to Harriette; who knew her, who knew her voice, who knew her songs; and to share that intergenerational wound that people have from everything that happened 150 years ago. There weren’t a lot of dry eyes in the room, particularly when Patti and Ray were speaking and when they were performing the song. This entry was posted in Education, News, Top Story, Tulalip News and tagged Harriette Shelton Dover, Tulalip From My Heart, Western Reads, Western Washington University by Kim Kalliber. Bookmark the permalink.